This toolkit provides resources for parents to help them respond effectively to reports of peer conflict and victimization and guide their children in applying WITS strategies. The resources below explain how to reinforce the WITS message at home, how to initiate discussions with children about conflict and victimization, how to detect and deal with problems and where to find support. A brochure that introduces parents to the WITS Programs, explains the important role parents can play in supporting the programs and provides tips about integrating WITS into daily home life. 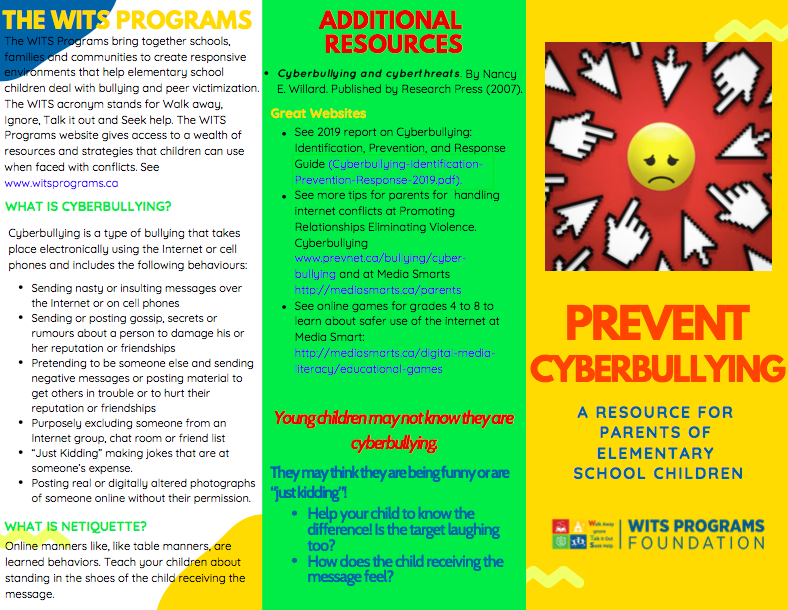 A brochure for parents about cyberbullying, explaining what it is, how it differs from other types of bullying, how to prevent it and what to do if your child becomes a victim of cyberbullying. Is Your Child Having Peer Conflict Problems? Parents hope their children will come to them for help if they’re having problems with peer conflict. Unfortunately, that’s not always the case. That’s why it is important for parents to be aware of common signs that their children are experiencing problems with peer conflict. This handout includes printable quick reference cards. Peer victimization rarely involves just the aggressor and the victim. There are usually bystanders who are part of either the solution or the problem. Use this quiz to initiate a discussion with your child about bystanders. When a child experiences chronic peer conflict, it may be necessary for parents to seek help on his or her behalf. Help determine the severity of the situation by using the LEADerS Journal Entry Template to jot down notes each time your child confides in you about a peer conflict problem. Parents want to help when their children are experiencing problems with peer conflict or victimization; however, they’re not always sure where to begin. The Pyramid of Support suggests sources parents can go to for help.